PCO Panda 4.2 back illuminated sCMOS camera system, a perfect fit in microscopy and life science optics. The pco.panda 4.2 bi is a powerful camera for situations where every photon counts. 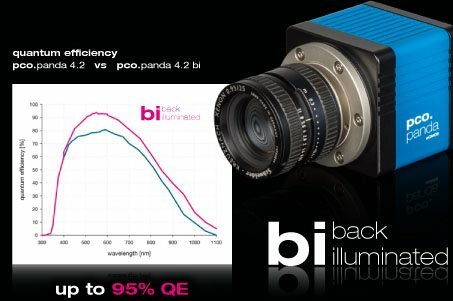 The back illuminated (bi) sensor can provide you with a quantum efficiency of up to 95 %. This makes the camera perfect for demanding lighting conditions, even without active cooling. The high resolution and 6.5 x 6.5 μm2 pixel size gives higher detail diversity and qualitative images. The USB 3.1 interface provides direct power delivery via the USB cable. the pco.panda 4.2 bi is ideal for countless applications in microscopy and life science.